Sam crouched in the darkness of the grass behind the gold tent, clenching his stomach to keep it from growling. The smells of fried food didn’t help. Even if he had money he wouldn’t buy anything here. Vendors jacked up the price of fairground food because they knew everyone was trapped once they crossed inside. He’d managed to slip in trailing a group of laughing teenagers around his age thinking he could get lost in the crowd for a few hours, score some easy cash. But not eat here. He needed to save his money and find a discount grocery or a bread thrift store. Sam played with the fraying edge of his jeans and picked at the knot holding his busted shoelace together. A man in a bowler hat slid neatly into the space ahead of him, blocking his view of the thoroughfare. Sam almost fell backwards, but realized the guy was too busy shoving things in and out of his pockets to notice him. He’d been looking for a mark, someone with a wallet full of cash. He could do it now while the man was distracted. Sam tightened his fingers on the scout knife, a remnant of better times, when he’d had a home and plenty of food and loving parents. A time before his dad took off and his mom died, before he kept moving from town to town. At first he’d done it to stay out of the clutches of the foster care system and social services, but now it was a habit he didn’t know how to break. He steeled his courage. “Are you sure?” A quarter appeared between the man’s index and middle finger. How had he done that? The man spun to face him, and Sam saw that he was dressed in a tuxedo t-shirt. He took off his bowler hat and then plunked the quarter into it. The coin made a soft thud against the felt. “I don’t know.” The man produced another quarter out of thin air and tossed it into the hat as well, where it clinked against the first. Sam’s palm grew slippery where he held the knife. The man pulled another coin from the air and threw it in with the others and they jingled. He smiled at Sam. 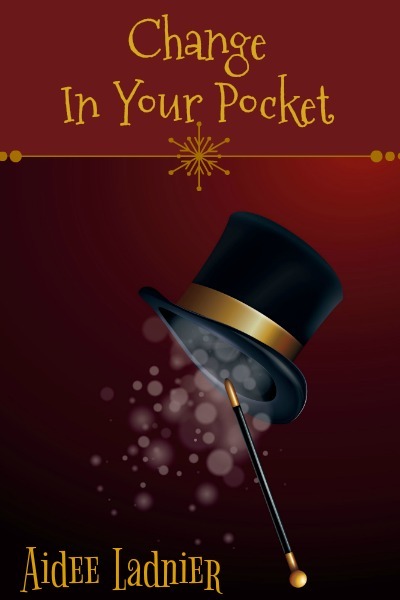 “A little change can add up over time.” He began pulling coins higgledy-piggledy out of the night until they rained down into his hat, weighing it down with each rapid toss. Sam marveled, reminded of the magician at a friend’s birthday party when he was ten. The man had linked flashing rings together and invited them to try to pull them apart. That seemed so long ago. “What do you need it for?” The magician’s voice lowered, sing-song and hypnotic. Sam’s eyes strayed to the bright fairgrounds just beyond the darkness, to the people laughing. He took a deep breath and his stomach gurgled again. “I’m hungry.” He’d never uttered a truer statement. He was hungry. Hungry for his mom’s arms around him again. Hungry for someplace to sleep where he didn’t have to keep one eye open for police or predators. Hungry for his friends and his teachers or anyone who would care whether he lived or died. It had seemed like the right thing, to take off after he found his mother overdosed in the bathtub. She’d told him his entire life that they needed to keep her problems quiet or social services would take him away. And then she’d have no one. But now she was gone and it was Sam alone. So he kept moving, never feeding that something in him that remembered a better time. The man let the his hat fall, his hands back at his sides. The corners of his mouth turned down, and a frown wrinkled above his eyes. “Money won’t feed you.” He shook his hat again, and it didn’t make a sound. Sam realized it was empty, that all the coins the man had pulled from the air were gone. The magician placed the hat back on his head. “Let’s go eat dinner at Frieda’s stall.” He pointed to the bright pavilion across the way, with rows and rows of tables and smiling, happy people sitting at them, eating. Sam’s head whirled. He shifted from one foot to the other. He wanted to eat. But this man could be leading him to security or something. Sam scratched at a scab on his arm. Sam took the card, squinting to read it in the dim light. “Preston’s Prestidigitory Emporium. Wonders for all ages. Miracles for all situations.” Sam turned it over. In big block letters were the words “Shop Assistant Needed. Must be handy with a knife.” Sam’s gaze flew back to the magician. “You’re a little on the young side. Fourteen, maybe?” The magician grinned. “Sixteen and a half.” The words tumbled out before Sam could stop them. “Excellent. We’ll discuss your salary over dinner.” The magician made a deep bow, ushering Sam out of the darkness and back toward the light.